Publisher / Place of Publication: EastWest Mapping / Clonegal, Enniscorthy, Co. Wexford. About: This detailed map covers the area from Woodenboley across to Lough Dan, down to Ballinaclash and over to Kiltegan. It has been compiled using satellite imagery combined with foot slogging, cycling and driving through the area and depicts in detail the network of tracks, paths, forests & hills of interest to walkers etc. Many historical sites are plotted and named and it provides an excellent panorama both for the rambler and armchair historian. Full title: Memorial atlas of Ireland: showing provinces, counties, baronies, parishes etc. in thirty-three double page maps. Compiled and drawn from the reliable official data and the latest information. Indexed. Creator / Author: L.J. Richards & Company. Visualization designed by Kris Meen. When Published:  1901. Digital visualization 2014. Publisher / Place of Publication : L.J. Richards & Company / 710 Provident Building, Philadelphia, U.S.A. Publisher / Place of Publication : James Hardiman Library, National University of Ireland, Galway / University Road, Galway. About: This is a lovely collection of maps of every county in Ireland. Each has now been digitised to an extremely high standard and zooming in brings up features in great detail. These include boundaries for baronies and civil parishes. It is also possible to search under these headings or browse on a county-by-county basis. Please note that the image files are large and may take a little while to download. Hat-Tip: To the James Hardiman Library, NUI Galway who have arranged for the digitisation of the Memorial Atlas of Ireland and its free accessibility online. Creator / Author: Richard Chandler. Publisher / Place of Publication: Richard Chandler / Fir Tree Cottage, St Marys, Chalford, Stroud, Gloucestershire, GL6 8PU England. 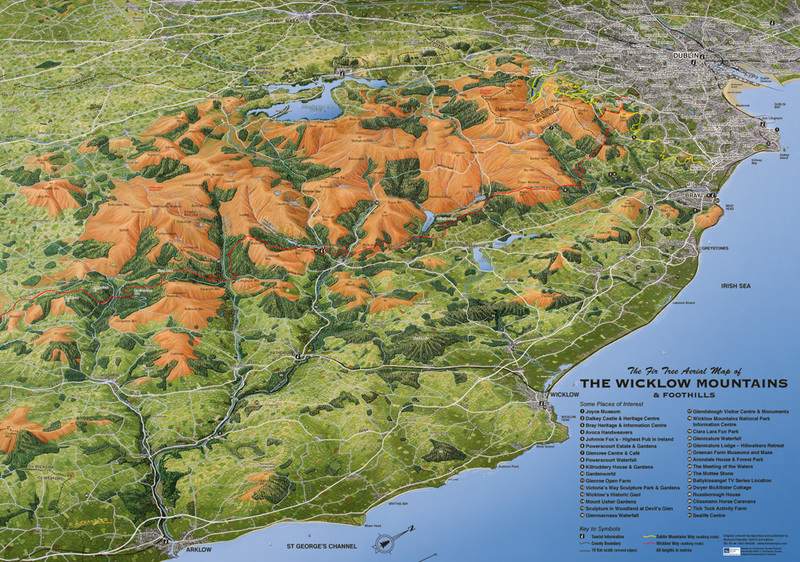 About: A map that gives a new perspective to the Wicklow Mountains and surrounding areas. It artistically interprets Ordnance Survey Mapping and aerial photography to provide a unique feel for the terrain that your ordinary map cannot convey. This map covers an area from Dublin City down to Coolgreany, across via Aughrim, Rathdangan and Grangecon, over to Narraghmore, onto Naas and back to Dublin. Unfortunately, coverage does not extend to Carnew, Shillelagh, Tinahely, Kiltegan or Baltinglass. Creator / Author: EastWest Mapping & Barry & Clive Dalby (Survey Team). About: This map takes in a major portion of the mountains located in the western half of the county. It has been compiled using satellite imagery combined with foot slogging, cycling and driving through the area. It includes many old placenames and historical sites and provides an excellent panorama both for the rambler and armchair historian. Lugnaquilla is not covered by this particular map, but is available as a separate publication.